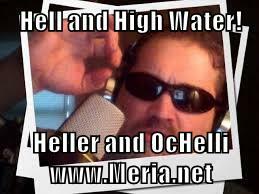 7/11/17 Hell and High Water with Meria and Chuck Ochelli. Back to 9/11/01 – why? It changed our reality worldwide, started illegal wars, police state and more; the documentary “911 -15 Years Later” where 343 firefighters initially died more since; differences between firefighters and the “thin blue line”; reinforcing the official story; clear as day what a story we were told; aluminum planes took down these buildings with steel cores? cement vs. steel; the old movie “Towering Inferno” worth watching;Iran finally exonerated why so long? Invasion of Iraq & Afghanistan;the CIA coup in Iran in 1953;trump and 9/11 investigation; trumps broken promises like his mind and body; amped up Obama’s wars; they are all puppets;G20 or G19?What if Obama had Malia sit in for him? Ivanka,Melania,Kusher – handlers? useful idiot? Russia & Israel;Donald Trump Jr in hot water; it’s a ONE party system, neither will do a thing;Reagan redux? Nixon redux? W redux?Pence-Cheney-George HW Bush;alzheimers or mad cow disease? chemtrails and aluminum and more.